The “tax reform framework” released by the Trump administration and Congressional Republican leaders on September 27 would affect states differently, but every state would see its richest residents grow richer if it is enacted. 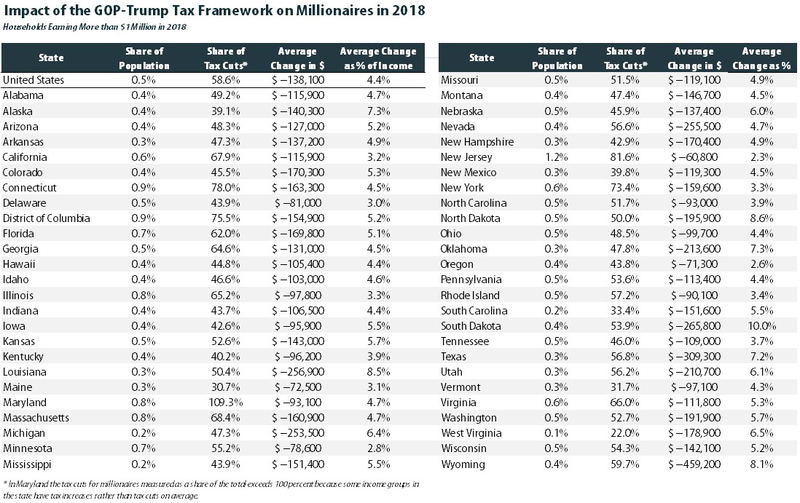 In all but a handful of states, at least half of the tax cuts would flow to the richest one percent of residents if the framework took effect. 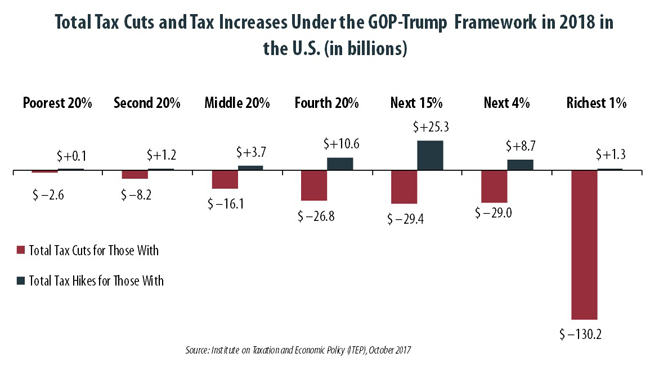 Nationally, more than two-thirds (67 percent) of the tax cuts contained in the framework would go to the richest one percent of Americans in 2018. These taxpayers are projected to have incomes of at least $615,800 next year. They would receive an average tax cut of $90,610 in 2018 alone, which would increase their incomes by an average of 4.3 percent. The middle fifth of households, people who are literally the “middle-class,” are projected to earn between $41,000 and $66,000 in 2018. These households would receive an average tax cut of just $410 next year, which would increase their incomes by an average of just 0.8 percent. The definition of “middle-class” varies by state but, as the state-by-state figures in this report demonstrate, in no state is this group the focus of the framework’s benefits. 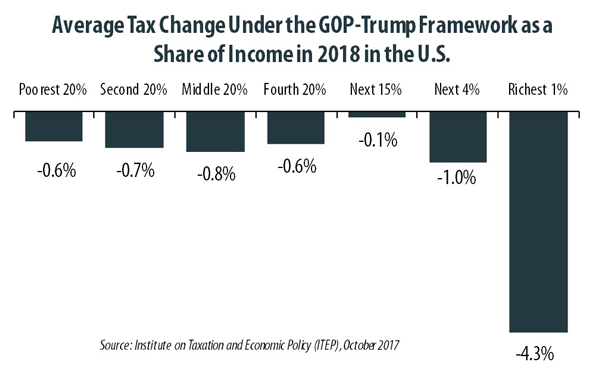 In fact, many households in the middle- and upper-middle portions of the income distribution would see their tax bills rise under the framework. While President Trump has insisted that the framework lays out a “giant, beautiful, massive … tax cut” that would be the “biggest ever,” many families would not know it from looking at their own tax bills. 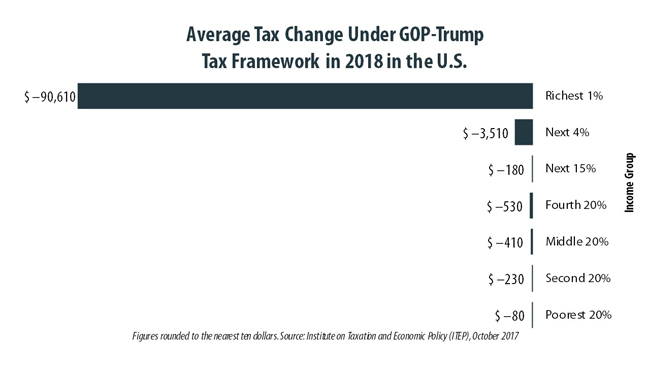 In total, roughly one in six Americans (16.7 percent) would see their tax bills rise next year if the framework were implemented in its current form, and that percentage would grow over time because of technical changes in the framework (i.e. “chained CPI”) that would slow the growth of tax benefits provided under the standard deduction, tax bracket cutoffs, and Earned Income Tax Credit (EITC). In promoting their plan, the framework’s authors have touted their decision to increase the standard deduction as evidence that their proposal was designed with middle-class taxpayers in mind. But in the broader context of the plan, which also repeals personal and dependent exemptions, most itemized deductions, and the extra deduction benefit available to elderly and disabled taxpayers, this increase is less about boosting tax benefits for the middle-class than it is about repackaging them in ways that benefit some taxpayers while raising taxes on others. Nationally, taxpayers with incomes between $111,000 and $241,000 would be the most likely to face a tax increase, with nearly 42 percent of this group paying more. The chart on the next page compares the increased taxes paid by those households facing tax hikes to the decreased taxes paid by those households receiving tax cuts in each income group. For the richest one percent of households, the tax hikes are insignificant compared to the tax cuts, which is not true for all other income groups. A key finding of this report is that the share of taxpayers who would face an immediate tax hike would vary significantly across states. In nine states and the District of Columbia (D.C.), over 20 percent of taxpayers would face an immediate tax increase. Those states include Maryland (30.5 percent), D.C. (27.7 percent), New Jersey (26.4 percent), Connecticut (24.3 percent), California (22.8 percent), Virginia (22.4 percent), Utah (22.2 percent), New York (22.1 percent), Massachusetts (20.5 percent), and Georgia (20.5 percent). The primary reason for this variation is that the plan relies heavily on repealing the deduction for state and local taxes paid in order to lessen the revenue loss associated with enacting top-heavy tax cuts for corporations, business owners, multi-million dollar estates, and high-income individuals. Since the impact of this deduction varies significantly across states, depending largely on the design of their state and local tax codes, the responsibility for funding the framework’s tax cuts varies as well. Taken on its own, repeal of the state and local tax deduction would primarily impact higher-income earners. In the context of the overall framework, however, its ultimate impact falls more heavily on families in the middle- and upper-middle portions of the income distribution. This is because while the taxpayers at the very top of the income distribution would initially be impacted by repeal, the tax cuts they receive in return for giving up their deduction are more than enough to offset that impact. The framework is far less generous in offering offsetting tax cuts to middle-income families. It is also important to note that the impacts of repealing the state and local tax deduction are far more sweeping than is often recognized. For the vast majority of taxpayers currently claiming itemized deductions, the loss of the ability to write-off income, sales, and property taxes means that these taxpayers will stop itemizing altogether, and will no longer receive any tax benefits associated with their charitable donations or mortgage interest payments. While roughly one in four taxpayers will claim charitable and mortgage interest deductions next year under current law, that number would plummet to less than 5 percent of taxpayers under the framework. In this light, the framework’s claim that it would “retain” the mortgage interest and charitable deductions to “help accomplish important goals that strengthen civil society … homeownership and charitable giving,” is misleading at best. And the dramatic reduction in itemized deduction benefits is key to understanding why so many middle- and upper-middle income families would see their tax bills rise under the framework. The framework would be particularly beneficial to households with incomes exceeding $1 million. 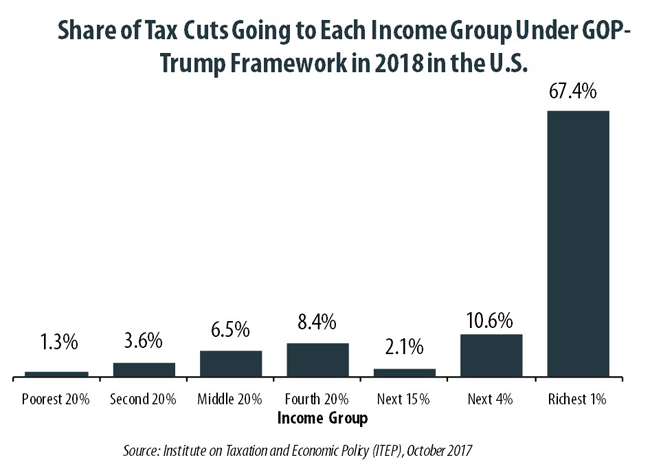 As the table on the following page illustrates, these households account for just half of one percent of the U.S. population but would receive 58.6 percent of the tax cuts in 2018 under the framework. The figures in this report have been calculated by the Institute on Taxation and Economic Policy (ITEP) based on the “framework” for tax reform released on September 27. Because the framework leaves many unanswered questions, the estimates required some assumptions, which are spelled out in this report. In most cases it is possible to interpret the framework as calling for changes that are very similar to those proposed by Donald Trump during his presidential campaign or proposed in plans put forward by Congressional Republicans. The alternative minimum tax (AMT) is a backstop tax meant to ensure that relatively well-off people pay at least some federal income taxes no matter how many special breaks they claim. In theory, the tax system could be simplified and special breaks and loopholes could be eliminated so that there is no need for the AMT. However, some wealthy taxpayers would pay little or nothing in income taxes if repeal of the AMT is not coupled with elimination of the many special breaks and loopholes that it limits. Donald Trump himself paid substantial AMT in 2005 and would have paid almost nothing in federal income taxes that year if not for the AMT. The framework would replace the seven income tax brackets in place now with three brackets. Most taxable income would be taxed at rates of 12 percent, 25 percent and 35 percent. Under current law, taxable income that takes the form of capital gains or stock dividends is subject to lower rates in each bracket. The framework does not mention capital gains and dividends, so this analysis assumes that they would continue to be taxed at rates of 0 percent, 15 percent and 20 percent. The lower income tax rates for capital gains and dividends provide the most regressive break in the tax code, but the framework would apparently maintain it. The framework does not specify the level of taxable income where each bracket begins, so this analysis assumes that the brackets would be structured like those contained in the tax overhaul proposed by the House Republicans in the summer of 2016. Lowering the tax bracket amounts could reduce the overall revenue loss associated with this plan, but would also result in tax increases for a larger number of taxpayers. Raising the tax bracket amounts would have the opposite effect. Some of the greatest beneficiaries of this new rate structure are high-income people who are currently in the 39.6 percent income tax bracket and would save substantially from having their marginal tax rate reduced from 39.6 to 35 percent. The framework leaves Congress with the option of creating another, higher bracket “to ensure that the reformed tax code is at least as progressive as the existing tax code and does not shift the tax burden from high-income to lower- and middle-income taxpayers.” ITEP will update its analysis to incorporate such a higher rate if and when lawmakers include it in their legislation. When calculating their taxable income, taxpayers are allowed to deduct amounts that Congress has decided should not be included in determining how much income is available to pay taxes, and expenses that Congress has decided to subsidize through the tax code for other policy reasons. Most of these deductions are known as “itemized” deductions and can only be claimed by taxpayers who do not choose to claim a standard deduction instead. Most taxpayers, particularly those who are not wealthy, claim the standard deduction. In other words, the standard deduction reduces the amount of income on which low- and middle-income people must pay taxes. The tax code also allows each taxpayer to claim a personal exemption for herself, her spouse and any dependents she has, which further reduces the amount of income that is subject to taxes. The framework increases the standard deduction, which reduces the amount of income subject to taxes for most families, but also repeals personal exemptions, which increases the amount of income that is subject to taxes. Whether this combination results in higher taxes or lower taxes for a particular family depends on their situation. Under current law in 2018 the standard deduction is likely to be $6,500 for singles, $13,000 for married couples, and $9,550 for “heads of households” (which essentially means single parents). The framework would increase the deduction to $12,000 for singles and $24,000 for married couples. This analysis assumes it would be increased to $17,550 for heads of households. The personal exemption will likely be worth $4,150 in 2018. This means that a married couple with two children would, under current law, be allowed to claim a standard deduction worth $13,000 and four personal exemptions worth $4,150 each, which amounts to $29,600 in total. This means that the family would not have to pay income taxes on their first $29,600 of income. Under the framework, these benefits would be replaced by a standard deduction of $24,000. Some families who lose benefits because their increased standard deduction fails to compensate for their lost personal exemptions might be better off nonetheless because of the framework’s proposal to increase the Child Tax Credit. But the framework does not specify the amount by which the child credit would increase. It does clarify that the refundable portion of the credit, which helps the poorest families, will not be increased. 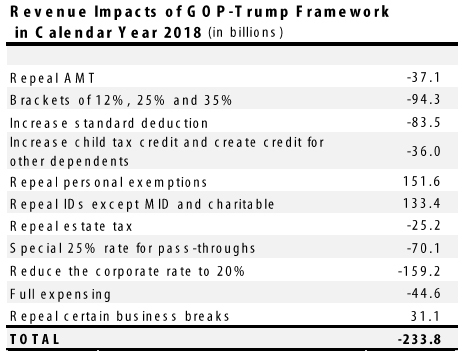 Because the framework’s general description of these changes matches the more detailed tax credit proposals in the House Republicans’ tax reform plan from 2016, this analysis uses the 2016 plan to fill in the framework’s missing information. This means the Child Tax Credit is assumed to increase from $1,000 to $1,500, but the refundable portion would remain limited to $1,000. We assume the framework increases the income level at which the phase-out begins for married parents from $110,000 to $150,000, which would make it exactly double that of single parents. It is curious that the framework lauds the mortgage interest and charitable deductions while drastically reducing the number of people who would actually claim them. ITEP projects that in 2018 under current law, the mortgage interest deduction and the charitable deduction will each be claimed by roughly a quarter of taxpayers. Under the framework, both would be claimed by fewer than 5 percent of taxpayers. With a more generous standard deduction and fewer itemized deductions to claim, more taxpayers would suddenly find that claiming the standard deduction is their best option. This is not to say that home ownership or charitable giving would necessarily be impacted by these changes as it is unclear that these deductions meaningful improve the rate of home ownership or charitable giving. The mortgage interest deduction benefits relatively well-off families who are likely to own a home regardless of what tax benefits are available. And charitable giving also seems to have little relation to the size of the tax breaks offered in return. Over the past several decades, the value of charitable deductions has fluctuated significantly (because marginal tax rates have changed) and there has been no correlation with the amount of charitable giving. The most significant deduction that would be repealed under the framework is the deduction for state and local taxes. It is not immediately obvious how the argument for repealing this deduction could be stronger than the argument for repealing the other two deductions describe above. Since the amount of state and local taxes paid is something that an individual has little or no control over, subtracting them from income arguably helps calculate how much income she has available to pay federal taxes. In other words, the deduction for state and local taxes is arguably more justified than other deductions, but the framework proposes to repeal it. The federal estate tax is paid only on the largest estates that are passed from one generation to the next. In 2017, a married couple could leave to their heirs an estate worth at least $11 million and no tax would be collected on it. Usually even larger estates avoid the tax as well because charitable bequests and certain other amounts are not included in the taxable estate. As a result, only about 0.2 percent — that’s two-tenths of one percent — of deaths result in estate tax liability. The Joint Committee on Taxation estimated that if the estate tax is repealed, more than 70 percent of the benefits would go to families with estates worth more than $20 million. Businesses that do not pay the corporate income tax are often called “pass-through” businesses, the idea being that the income is passed through to the owners and reported on their personal income tax forms. Sometimes pass-through companies are mistakenly characterized as small businesses. The truth is that many law firms, hedge funds, and even huge companies like Bechtel are structured as pass-through companies. It’s also the case that the owners of pass-throughs who receive most of their profits are mostly, but not entirely, high-income individuals. The framework includes a special tax rate of just 25 percent for this income. According to ITEP’s estimates, 87 percent of the benefits of this change would go to the richest one percent of taxpayers in 2018. This proposal could cost far more than is estimated in this report because highly compensated individuals could respond to the change by routing their income through pass-through entities to take advantage of the lower rate. For example, if John Smith is the CEO of ACME and is paid a salary of $10 million a year, most of that salary would be subject to the top income tax rate of 35 percent under the framework. Smith could instead form a new pass-through entity called John Smith Services, which contracts with ACME to provide management services. Instead of receiving a salary from ACME, Smith would receive pass-through income that would be taxed at just 25 percent. The framework would reduce the statutory corporate income tax rate from 35 percent to 20 percent. President Trump has frequently stated that the tax rate for corporations is too high. During his address to Congress on February 28, he claimed that America’s corporate income tax rate of 35 percent is the highest in the world, making our companies unable to compete. But the effective tax rate paid by American corporations (the share of profits actually paid in taxes) is far less than 35 percent because of special breaks and loopholes in the tax code. A 2016 study produced by the Government Accountability Office found that the effective tax rate paid by large, profitable American corporations from 2008 through 2012 was just 14 percent. It found that the share of these corporations paying no federal income tax at all was 19.5 percent in 2012 and 24.1 percent in 2011. A recent study from ITEP examines a particularly profitable group of corporations – the Fortune 500 corporations that were profitable each year from 2008 through 2015. Even among these super-profitable companies, there were several with effective tax rates that were close to zero or below zero for the eight-year period. With so many corporations are already paying little in tax, there is little justification for reducing the statutory corporate income tax rate as proposed under the framework. The framework states that the domestic production deduction “will no longer be necessary” because of the lower tax rates on businesses. It says that “numerous other special exclusions and deductions will be repealed or restricted” but provides no specifics. The framework specifically preserves the research tax credit and the low-income housing tax credit but says it “envisions repeal of other business credits,” although it leaves it up to Congress whether more credits should be retained. This analysis assumes that the domestic production deduction and all tax credits for both pass-through businesses and C corporations (corporations that pay the corporate income tax) would be repealed except for the research credit and low-income housing tax credit. Companies are allowed to deduct from their taxable income the expenses of running their businesses, so that what is taxed is net profit. Businesses can also deduct the costs of purchases of machinery, software, buildings and so forth, but since these capital investments don’t lose value right away, these deductions are taken over time. In other words, capital expenses (expenditures to acquire assets that generate income over a long period of time) usually must be deducted over a number of years to reflect their ongoing usefulness. In most cases firms would rather deduct capital expenses right away rather than delay those deductions because of the time value of money (i.e. a given amount of money is worth more today than the same amount of money will be worth if it is received later). For example, $100 invested now at a 7 percent return will grow to $200 in ten years. Congress has provided breaks that allow businesses to deduct these costs more quickly than is warranted by the equipment’s loss of value or any other economic rationale. The framework would expand this treatment into immediate full “expensing,” meaning the entire cost of the investment could be deducted in the year it is made. A report from the Congressional Research Service reviews efforts to quantify the impact of depreciation breaks and explains that “the studies concluded that accelerated depreciation in general is a relatively ineffective tool for stimulating the economy.” Businesses make decisions about investing and expanding their operations based on whether or not there are customers who want to buy whatever product or service they provide. A tax break subsidizing investment will benefit those businesses that would have invested anyway but is unlikely to result in much, if any, new investment. The framework would provide full expensing for investments other than buildings (and other than land, which does not wear out) for “at least five years.” Given Congress’s track record with these types of temporary business tax breaks, it is very likely that this type of expensing will eventually be made permanent, or at least repeatedly extended, at the conclusion of the initial 5-year period. A major problem with generous depreciation breaks (particularly full expensing) is that they create tax avoidance opportunities for businesses that are able to borrow to finance investment. A taxpayer who borrows money to make an investment can deduct interest paid on the debt as a business expense, and combined with a full deduction of the cost of the investment in the first year, this results in a double deduction for the investment. The effective tax rate on debt-financed investment could therefore be negative, meaning some investments would have an after-tax return that is higher than their pre-tax return, encouraging companies to make investments that do not make economic sense outside of their tax avoidance potential. The framework takes tepid step towards acknowledging this by saying that interest deductions would be “partially limited” for C corporations (businesses that pay the corporate income tax) but provides no details. It also says that Congressional committees will “consider the appropriate treatment of interest paid” by other businesses. Because no details are provided, this analysis does not include any such limitation on interest deductions. However, this analysis also does not assume any increased tax avoidance resulting from full expensing (which the limits on interest deductions would counteract, in theory). The actual revenue impact of full expensing could be far greater than this analysis concludes if companies are allowed to abuse full expensing. The framework would provide American corporations with a “100% exemption for dividends from foreign subsidiaries,” which is another way of saying American corporations would pay a zero percent U.S. tax rate on their offshore profits. Countries that provide this break are often said to have a “territorial” tax system. This analysis does not include estimates for this proposal because they are highly uncertain, but it is very likely that the result would be greater offshore corporate tax avoidance and thus a reduction in tax revenue, as explained in another ITEP report. Under current rules, American corporations are already allowed to “defer” paying U.S. taxes on profits that they report earning offshore. This has created an incentive for corporations to use accounting gimmicks to characterize profits earned in the U.S. or other countries where they do business as earned in countries with very low corporate taxes or no corporate taxes at all. By effectively shifting profits to these offshore tax havens, corporations defer paying much of anything on their profits for decades, possibly forever. We know that American corporations engage in these accounting gimmicks because the profits they report to the IRS as having been earned in low-tax countries are impossible. For example, American corporations reported that their subsidiaries in the Cayman Islands earned a total of $46 billion in 2012, but this is impossible because that tiny country’s entire economic output that year was only $3 billion. Shifting to a territorial system would only increase the rewards for this type of offshore profit-shifting. Whereas the current system allows corporations to defer paying taxes on profits they characterize as having been generated offshore, a territorial system would completely exempt profits they characterize as having been generated offshore. Largely because of deferral and techniques used to take advantage of it, American corporations today are officially holding $2.6 trillion in profits offshore. In many cases this money is “offshore” only as an accounting matter, but the result is that U.S. taxes are not paid on it. Another proposal in the framework would transition to the territorial system by imposing a one-time tax on this $2.6 trillion that corporations hold offshore right now. There would be no further U.S. tax on these profits. The proposal does not specify what the rate would be, but during President Trump’s campaign he proposed a one-time tax on these offshore profits at a rate of ten percent. In the long-run, this would be a significant break for corporations that otherwise would have to pay the full U.S. corporate tax rate on these profits. The proposal would raise revenue in the short-run, but because this is only a temporary, one-time impact, it is not included in the estimates for this report. The framework includes at least two important changes that would have no impact in the short-term, but would raise taxes on most families in the longer-term. First, the framework recommends using “a more accurate measure of inflation for purposes of indexing the tax brackets and other tax parameters.” This appears to be a reference to the “chained Consumer Price Index (CPI),” which tends to grow more slowly than the ordinary CPI to which tax parameters are currently tied. In years after 2018, the practical effect of this change would be to lower the value of various indexed tax breaks relative to what would be offered if the tax code’s connection to the ordinary CPI were retained. This would reduce the long-run revenue loss associated with the framework, but would also tend to have a regressive effect since the provisions it impacts (most notably the standard deduction, Earned Income Tax Credit, and the lower brackets) are more significant to lower- and middle-income families, when measured relative to their incomes. Second, the framework replaces the inflation-indexed exemption for taxpayers’ dependents with an unindexed boost to the Child Tax Credit. This report assumes that the Child Tax Credit will be increased by $500 under the framework, which provides a benefit that is nearly identical to the $498 benefit that would be offered by the existing $4,150 dependent exemption if it were taken against the framework’s 12 percent bottom income tax rate in 2018. This parity will not last long, however, because while the benefits of the existing $4,150 exemption are scheduled to grow with inflation in the years ahead, it appears that the Child Tax Credit’s benefit will remain frozen in time. As a result, this exemption-for-credit swap will gradually become a costlier tradeoff for families with children. Since this report is focused on the impacts of the framework in 2018, the gradual impacts of these two policy changes are not reflected in the analysis. It is important to note, however, that these two changes would steadily increase the share of taxpayers facing tax increases, relative to current law, in the years ahead. The tax reform framework negotiated between the Trump administration and Congressional Republican leaders is heavily tilted in favor of the nation’s wealthiest taxpayers, providing more than two-thirds (67.4 percent) of its benefits to just the top one percent of earners. Despite dramatically reducing federal revenue collections, the plan would also increase taxes on a significant number of American households. One-in-six households (16.7 percent) would face a tax increase in 2018, and that figure is likely to grow over time. Nationally, upper-middle income households are the most likely to face a tax increase under this framework. But the share of households seeing their taxes rise would vary significantly across states. In nine states, over 20 percent of households would face a tax increase under the framework, in large part because of its proposed repeal of the deduction for state and local taxes paid. The House Republican tax plan proposed turning the existing 10 percent and 15 percent brackets into a 12 percent bracket, the existing 25 percent and 28 percent brackets into a 25 percent bracket, and the remaining brackets into a 33 percent bracket. This analysis assumes that the Framework would do the same except that the top rate would be 35 percent rather than 33 percent. Matthew Gardner, Robert S. McIntyre and Richard Phillips, “The 35 Percent Corporate Tax Myth: Corporate Tax Avoidance by Fortune 500 Companies, 2008 to 2015,” March 2017, https://itep.org/the-35-percent-corporate-tax-myth/.